It is hard to believe that in less than a week we will announce the 62nd Oklahoma Teacher of the Year. As my TOY year is winding down, I have been getting a lot of questions about the experience and how I changed throughout it. It may take some time for me to download and process all that this year contained before I can fully answer those questions, but a few things are clear. Perhaps more than anything else, I have seen the power of the teacher’s voice. Prior to this year, my world admittedly existed within the four walls of room 407—my classroom (and perhaps also our local track and cross country course). I was focused on investing in the lives of my students first and foremost, only assisting my colleagues as needed. I didn’t find myself drawn to share on a larger scale. When policy or mandates were passed along I did what most hard-working teachers do: I tried to wrap my head around what was really being asked of me, determined how that would ultimately affect my practice, and then put my head down and went back to work. Sometimes those orders were positive and many times they were not. One thing was constant, regardless of how I felt or what I thought, I didn’t say a word — opting instead to remain within the comfort of what I could control. This year has been marked by many things, and none of them allowed me to stay inside my comfort zone. I have had countless opportunities to stand before pre-service teachers, practicing teachers, administrators, policy makers, government officials, and various other education stakeholders. In each instance I have been asked point blank what I thought. I no longer had a place to hide; it was time to share my experience as an expert in my field. What did I learn from those moments? I had something to share, and people were interested in hearing what I had to say. My sense is that there are many teachers in the same position as I was — working hard but thinking that there is little hope of ever making a change. To the teachers who feel that way, I say get out and share. I have found that the climate is ripe for teachers to stand up and share. 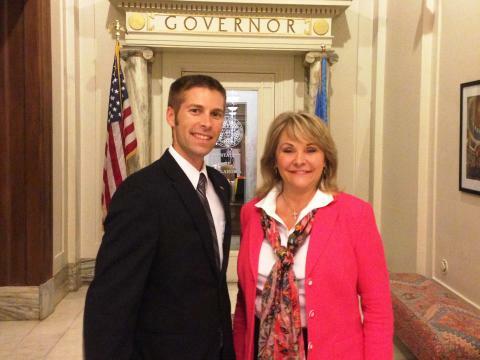 For instance, earlier this month I had the opportunity to sit with Governor Mary Fallin’s policy director and brainstorm ways to get more teachers to the table when discussing education policy. Our voice does matter, but don’t waste your opportunity to only share your complaints, that is done enough already. Instead share your stories, your experiences within your classrooms, and offer solutions to problems that you see. Your solution may or may not be the answer, but it is at least a better option than using your opportunity to only complain. As I’ve stated in many of my talks in the past year, it takes a teacher’s heart to truly tell the story of what we do. So as I look forward to welcoming the next Oklahoma Teacher of the Year, I also look forward to continuing my TOY experience and sharing my expertise and love for the profession for many years to come.